One of our favorite RV types is the Class B. This often misunderstood option has a lot more to offer than most potential buyers realize. So, to celebrate this convenient camper, we’re here to share the top 10 reasons for traveling in a Class B Motorhome! Towing is unnecessary, everything you need is all in one unit! The ease of being able to come and go without having to worry about bringing along extras to complete the trip is wonderful. Unlike other motorhomes, the Class B gets you more miles per gallon thanks to the lighter weight. That’s money savings that can go right into more souvenirs! The compact nature of the Class B makes it great for the road since it handles like a regular van. That makes it a handy option for first time RVers as well as those who are new to motorhomes. It’s also a fit for many home garages. A Class B is also referred to as a campervan because it’s a similar shape to a van, which makes for steering and highway driving to be easier to get around when compared to other types. This also extends to most campsite spaces as well as parking spots. 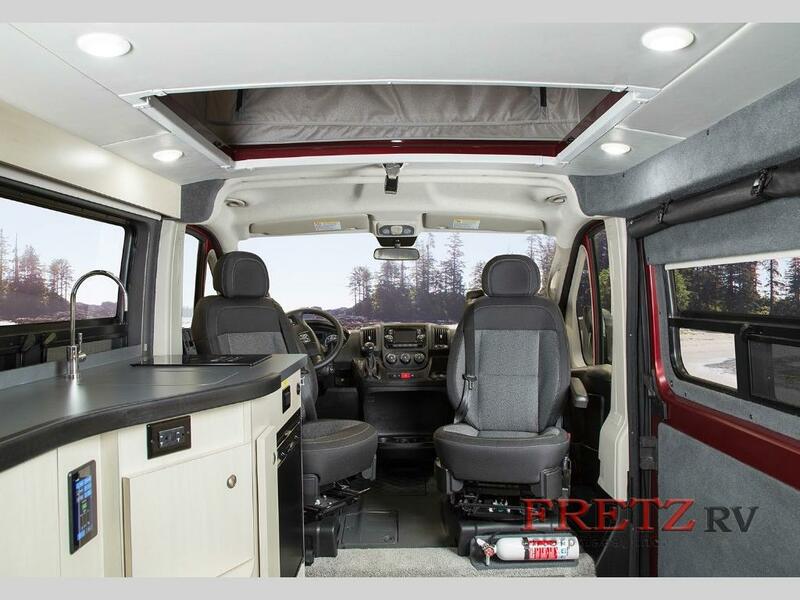 You won’t have to worry about getting to a campsite for hookups in a Class B every night to stay comfortable. In fact, you can go a few days before having to re-up! Due to the benefits of boondocking, the places you can rest are abundant. Here’s a few places you can actually park your RV for free: truck stops, Walmart, and even casinos. In addition to the free parking options, you have the benefit of friends and family parking! Not only can you stay for free on their property, you have the added comfort of having your own hotel room while you visit. That makes less of a hassle for your hosts and more time to enjoy being a guest. There’s also the added benefit of having your home away from home in walking distance. Another money saving trick when using your Class B is the kitchen. Not only do Class B models come equipped with a dinette or galley kitchen, they have water pressure like that of a grounded house so when cooking and cleaning, you feel right at home. The luxury of making fresh meals from wherever you’re parked should never be underestimated. Having a more condensed space means less area to warm up! Not only is it faster to heat a campervan in cold weather, it’s also pretty quick to get ready for the chill of travel. Things on the shortlist to do ahead of time: install curtains for easy insulation, empty holding tanks and put in pink antifreeze, use a heated water hose, seal skylights, and clean your furnace before testing to ensure no surprises on the road. Less is more would be a great motto for the Class B. While some may have a pre-conceived notion that there’s not enough room inside, it’s actually possible to include up to 4 people on a trip! Floorplans vary but all come with the room needed to cook, wash up, stretch out, and enjoy the drive. Have you learned something about the Class B? Hopefully this list has shed some light on the fun, road trip vehicle known as a campervan. If you haven’t seen one in person, come and delight your senses with a walk through right here at Fretz RV just north of Philadelphia! You just might even feel the need to take one home. If you have any questions about a particular Class B or any other RV model, feel free to give us a call at 215-723-3121. You can also connect with us and other RVers on Twitter or Facebook!